Media Prefs emerged from the mind of Dr. Pam Cox-Otto, a 40-year veteran of community college marketing and CEO of Interact Communications. Each semester media salespeople would pound on her door saying, "Buy this!" and "I'm sure we're reaching your market." And, just as consistently, Faculty and Leadership would pound on her door, saying, "Fill this class/program," "Put an ad in the newspaper, or make me a TV spot, now!" every Fall and Spring. And Media Prefs was born. The idea is simple. Dr. Cox-Otto developed a survey using scaled questions (research jargon alert!) from academic media research, with questions about how much TV, radio, newspaper, social media, and other modern media types that respondents consume. And, because Dr. Cox-Otto is a community college marketer, she added questions about college recruiting, communication about college services, and how, when, and about what, students want to be informed. 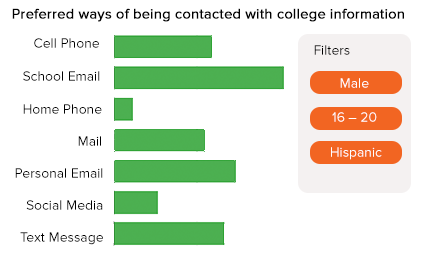 The result is a comprehensive survey that measures how an individual is currently consuming media, and how the college should communicate with them. Interact has spent the last 10 months developing its own proprietary display system for local and national college data. One simple login gives you the power to filter results by audience, location and dozens of other factors. This is a powerful way to display and manipulate your data, in real time, without the high costs of custom statistical software. Hispanic males in you area? You can share your data with your faculty by giving them the login information. The more, the merrier. Our one fee covers access for your entire college. Want to download the graphs? Easy! Just hit the export button. Are you tired of anecdotal evidence? Then commit to data. Real data. Current data. Your students' data. With Media Prefs you can reach a larger segment of your market – faster, with more clarity, and for less money. How do we reach those 18- to 25-year-old male students who are not showing up? What’s the best way to recruit high school students… according to the students themselves. Which social media platforms are growing? And which are graying? With Media Prefs, you can deliver information to current students in a format they will actually use. How effective is your student portal in reaching your current students? How often do your students check their email… and do they even read it? For the first time, with real data, you can help move the discussion on how to best reach students with information about financial aid, advising, intervention and support.